I’m delighted to hear this bit of news given to Cllrs today. The Silver Bridge, The Guinness Bridge, The Ironer… Whatever you call it, it’s part of the heritage of Palmerstown and deserves to be preserved and eventually brought back into public use. This was one of the projects I helped with in the last few years. 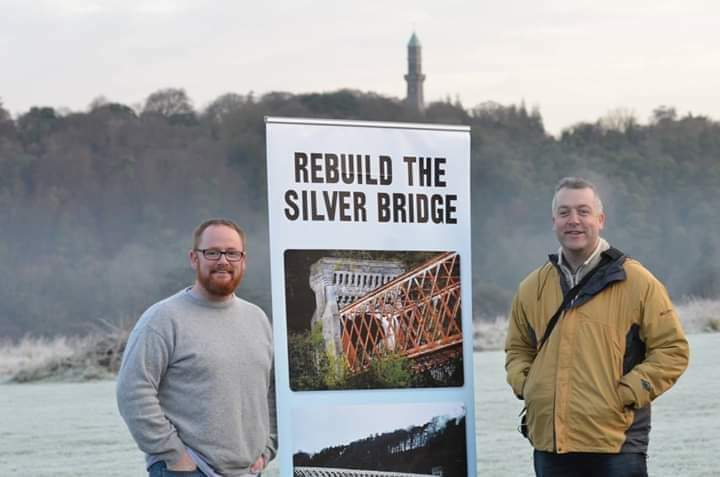 Led by Paul Corcoran and Robert Francis who started the Rebuild the Silver bridge. We got it on the final list of projects for the Participatory Budgeting scheme and we got people to vote for it as one of the final projects to be funded. Looking forward to seeing what happens next. Thanks to Paul Gogarty for keeping us informed. “I just received word this afternoon from Fingal County Council that following an evaluation of the tenders received on e-tenders (RFT 147360) for the feasibility report into the Silver/Guinness Bridge that straddles the River Liffey at Lucan/Palmersto(W)n , that they have recommended acceptance of the quotation from Casey O’Rourke Associates Ltd in the sum of €21,395 (ex VAT @23%). They will provide professional consultant services for structural engineering services including survey, costing and preliminary design.